When it comes to Mother Nature, Beaver County, and western Pennsylvania in general, is typically immune to natural disasters. Earthquakes never happen, we are too far inland to get hit by hurricanes, and tornados are extremely rare. Up until 1985, the worst natural disaster to hit Beaver County was the great flood of 1936 that devastated some of our river towns, such as Rochester and Bridgewater. But 30 years ago today, the unexpected happened. 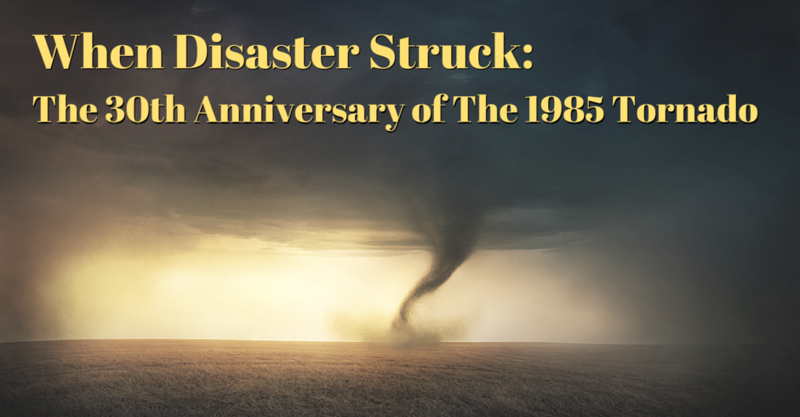 A massive tornado ripped through northern Beaver County, specifically Big Beaver and North Sewickley Township, on May 31, 1985. It is a date that will live in infamy for Beaver Countians, one of those ‘where were you when it happened’ moments. It was one of, if not the worst, natural disaster to ever hit the County. A typical Friday night in late spring turned into a night of horror for those affected by this tragedy. More than 200 homes were hit, and the tornado caused over $5 million in damage. The tornado left a path of carnage over 13 miles and claimed three lives: Carl Mosketti, Gladyce Brenson, and Diane Flinner, all Beaver County residents. Mosketti and Brenson were killed when the tornado tore through the Big Beaver Plaza on Route 18 just north of downtown Beaver Falls, and Flinner was killed inside a home in North Sewickley. For 20 minutes, those in the tornado’s path had to endure a living nightmare. The twister started in the western part of the county, and gradually made its way east. In North Sewickley Township alone, 260 homes were damaged. An estimated 10 to 15 homes were leveled, while another 50 were beyond repair. Several businesses were also leveled, such as the Spotlight 88 drive-in theater located at the intersection of Routes 65 and 588, Kemp’s Butcher Block, and J&J Supply. The carnage in North Sewickley was so bad that a beer distributor had to be converted to a first-aid center. Another refuge center was set up at Riverside High School. The threat of looting was so real that the National Guard was called in to assist with security and traffic control. Some of, if not the worst damage – and the place people probably identify with the most – is the Big Beaver Plaza on Route 18. Even today when I drive by it, I think of the tornado wiping out the entire plaza. It was the single biggest disaster zone of the tornado. 12 businesses were inside the plaza at the time, including a Jamesway Department Store. Comet Food Warehouse was the only business to rebuild in the plaza after the devastation. 10 people were admitted and 38 people had injuries that were treated at the Medical Center as a result of the tornado. Another five people were admitted and 40 people treated at the Ellwood City Hospital. One of those treated at the Medical Center was Marie DeRose, then of Beaver Falls, but now resides in Hopewell. I was able to sit down with DeRose as she recalled her horrifying experience, and what it was like on that fateful night in Beaver County. In an event that feels like yesterday to many people, the passage of time has taken us 30 years away. Do you remember the night of May 31, 1985? Where were you when the tornado hit?  Archived in Events, Stories and tagged archive, events, tornado.